I’m not familiar with the ER collets and before I order a spindle for my CNC router I want to understand these collets. Searching the web does not answer my questions. The spindle I want to order comes with ER11. If later I want to change to ER20 or another ER number would the new ER fit my spindle? And how do I know what size bits the ER's will take? 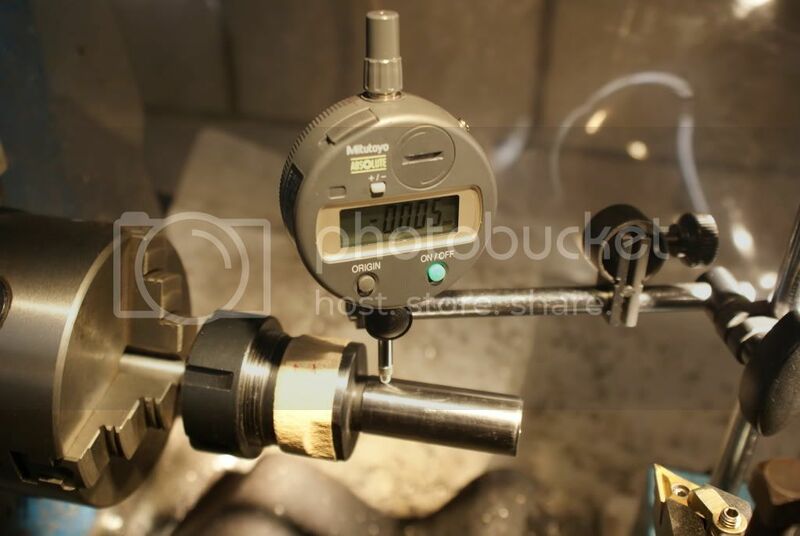 The number is the outside diameter of the collet in mm. So there is no way you can put ER20 collets in an ER11 spindle. You can see sets of ER11 collets on eBay and that will tell you the diameter range of the set, which is .5 mm to 7 mm, or just enough to hold 1/4" router bits. If you are only using 1/4" bits, you just need one collet, the 6.0-6.5 mm size. Each collet will hold any shank within its .5 mm range. There are several different makers of these collets, and obviously the Chinese collets cost less than the Swiss collets. ER20 collets hold shanks up to 13 mm. Rule one for ER collets is to correctly insert the collet into the nut and then attach it to the spindle. The nut has a feature that extracts the collet from the spindle so it loosens up and lets you change bits. If you put the collet in the spindle and then attach the nut, you ruin the nut and may cause other problems. I purchased this set from Hong Kong seller. Delivered quick time to UK. It is very good. The range is 2 to 7 mm by 0.5 increments . Because the collets are split from both ends, they close down parallel. I was so impressed that I then bought, from the same seller, a morse 3 holder for my lathe and a 20mm parallel holder for my Aciera F3, both holders to suit my set of ER32 collets . Now I must admit that measuring in mm drives me nuts because all my life I used Imperial and I have no feel for mm; I mean I know instantly how big is 1” but tell me lets say 10mm and I have no clue how big it is and yes I can make the conversion but that’s no convenient. So what is so special about these ER collets? Can I change my ER11 and get another collet in Imperial measures? Any suggestions? Your method of testing would introduce the potential lathe chuck runout . pin in the ER collet using a DTI. All the tests that I did showed no measurable runout.As stated, I had also bought A 20mm parallel holder for my own ER32 collets. When fitted in the 20mm spindle nose of my Aciera F3, there was again no runout introduced by the HK collet holder. In the original Ebay listing it suggests accuracy of 0.01mm which equates to 0.0003937" The link above seems to have cut off the bottom descriptive part of the listing . I am not suggesting that they would stand up to 'all day every day' use in industry . But perhaps the most expensive ones that you can buy wouldn't either . I think that you are confused on two counts . 1. ER11 is the size of the collet bodies, and nothing to do with the back end of the holder that goes into your machine spindle . What does your spindle take ? Morse 1 ,Morse 2 Morse 3 or what . If you go to the HK link that I posted ,click on 'SHOP' and then search on 'ER Collets', you will see a whole range of different holders for ER style collets. You can probably get a holder that suits your machine that can take bigger collets than ER11. 2. You don't need to do a conversion of imperial to metric for ER style collets . and select the the one that the tool just fits into . ie, the one which is just 0.5mm bigger than the one that the tool will not fit into . You mount the collet into the Nut ( that's Very important), and screw the nut on to the holder . Insert the tool and tighen the nut to clamp the collet on to the Tool . When you loosen the nut later, a device inside the nut draws the collet out of the taper in the holder . And thats all here is to it .!!. Quicker to do than to describe. i believe measuring like this. introduces less error, because you take out most of the play of the bearings. on the mill they just flipp around. that's only going to work if your chuck is dead nuts and i'm pretty sure that 99% of three jaw chucks out there have way more runout than any ER collet. i would chuck up an over sized bar, cut it down to the size of the collet and then without disturbing it install the ER chuck. I suspect the OP is planning to buy a Chinese motorized router spindle with integral ER11 collet chuck. So there is no adapter involved. I see they make these spindles in a larger size for ER20 collets, so the purchaser can decide on whether he wants to have 1/4" shank capacity or 1/2" shank capacity before he buys the spindle. As for metric sizes, you can buy ER collets with inch sizes marked on them. I don't know if a 1/4" collet is a different size from a 6.5 mm collet. It could just be a different marking on the same collet. You will have all of the info you need from the inventors of ER collets. ER collets are fine if you dont need a tool change, that is the #1 downfall with them is it is not a fast tool change. plus you need to get them tight, use a big hammer. Do not be wimpy when torquing them down. ER collets are fine if you dont need a tool change, that is the #1 downfall with them is it is not a fast tool change. that's why you need a bunch of holders. very nice for jobs with a bunch of oddball drill sizes when you don't want the danglage of normal drill chucks.